We would love to hear from you if you have used Thompson’s WaterSeal. Please post a rating in the Consumer Star Ratings below. Thompson’s WaterSeal has clearly not been a consumer favorite with deck sealers. Mainly as it does not offer any UV protection and it grays is months. If you have any pictures of your experience with the Thompson’s WaterSeal you can add them in the comment area with a detailed description. Thompson’s® WaterSeal® Waterproofer Plus Clear Wood Protector is designed for all exterior wood and decking surfaces. This protection includes: Water repellency, prevents water damage, maintains natural wood grain, all while resisting mold growth. Thompson’s® WaterSeal® claim to fame is the ability to waterproof your exterior wood. We tested the Thompson’s® WaterSeal® in the Clear finish. – Thompson’s® WaterSeal® Clear did not alter or change the appearance of the wood. After full drying, we tested the ability to repel water. Water did bead on top of the finish and did not absorb into the wood. – As far as we can tell, Thompson’s® WaterSeal® does not prevent UV graying at all. This is a huge disappointment as preventing UV graying is the number one reason to stain your exterior wood and decking. 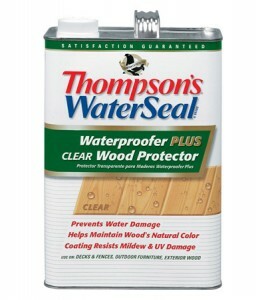 – Thompson’s® WaterSeal® penetrates deep into the wood. There was no peeling or wearing. We would have given it a 10 if the product still repelled water but it did not.